Clarence Seedorf was appointed as Cameroon coach in August 2018. 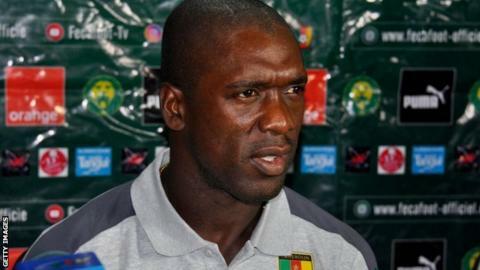 Cameroon head coach Clarence Seedorf says he is addressing the team's goal-scoring worries ahead of their decisive Africa Cup of Nations qualifier against Comoros on 23 March in Yaounde. The Indomitable Lions, second in Group B, need a draw to qualify for this year's finals in Egypt, after Cameroon were stripped of hosting rights. Cameroon have scored twice in five games since Clarence Seedorf took over and have failed to score in their last three games against Malawi, Morocco and Brazil. "Scoring goals comes and goes with time but the most important thing is that we continue creating chances. The entire team must work and we then we have to score goals," Seedorf told reporters in Yaounde on Monday. "We have to improve on our free-kicks and corners. We have to take advantage of our great physical power and the height in the team. This is something we've analysed and are keen on improving," the former Dutch international said. With Villarreal striker Karl Toko Ekambi suspended for the Comoros game and FC Porto marksman Vincent Aboubakar and Angers forward Stephane Bahoken both injured, Seedorf knows getting the goals will be problematic. "Our hottest striker at the moment, Toko Ekambi is unavailable. He's been on fire in the last months and would have had a good impact on the team. We have to work with those in the squad who've shown some exciting things during training sessions." Seedorf has been criticised in local media for some of his call-ups, amongst them 35-year-old goalkeeper Idris Carlos Kameni who is yet to play a game this season with Turkish outfit Fenerbache. "Kameni brings in great leadership to the team and this is something we need in the squad at the moment. His leadership qualities are more important to the team now than whether he is playing or not. We have two other good keepers," said Seedorf, who was also questioned about why Liverpool centre-back Joel Matip and Torino defender Nicholas Nkoulou are not in the squad. "We've been speaking to Matip, Nkoulou and other players. Their absence in the national team is not down to us but them. We've been hunting for players and it's either they want to play for Cameroon now or they don't. "We have shown lots of interest but it's a personal decision the players have taken and we respect it. We hope with time things will change." A complaint filed by the Comoros football federation at the Court of Arbitration for Sport (Cas) calling for the elimination of Cameroon after they lost the hosting rights of the 2019 Nations Cup has threatened to cast a cloud over the game. Seedorf says he is unaware of what is happening with that challenge, but insists his players will stay focused ahead of Saturday's game. "This is not something we're thinking about. Officials of Fecafoot will handle this. As a team we just want to play and win the game. I hope the fans will come out in their numbers to cheer us." Seedorf, who turns 43 on 1 April, has said he is undecided about his future should Cameroon miss out on a place in the 2019 Nations Cup. "I don't know what the future will be and I'd stay optimistic. We have a good team and I'm sure we'll get a positive result." The Indomitable Lions begin preparations on Monday for their encounter against Comoros at the Ahmadou Ahidjo stadium in Yaounde.